Rob is the best of what this country has to offer. He exemplifies the characteristics of a true public servant. Rob risked his life to defend freedom as a United States Marine, then again as a firefighter and police officer. Now, Rob is saving lives as a Paramedic here at Trinidad Ambulance District. He also serves as our county’s Emergency Preparedness Coordinator. 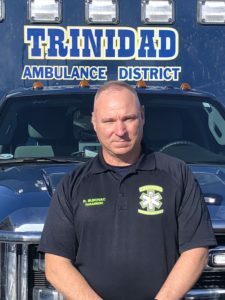 We are proud and honored to have Rob as a teammate at the Trinidad Ambulance District.